Tradescantia ohiensis is more commonly known as bluejacket or Ohio spiderwort. It grows to 1-3 feet and produces bright blue, 3-petalled blossoms in early June to mid-October. Back in January ’14, I tore a tendon in my thumb. It was a freak accident that occurred while I was easing into parking spot at CVS. A driver backing out off the next spot over didn’t see me. I tried to sound my car horn to let her know I was there. The horn was broken, unknown to me at the time, and I tried sounding it over and over in a panic, desperate to alert another driver of my presence while her car backed towards mine. My hand was at a strange angle with my thumb on the horn and other fingers on the steering wheel. My adrenalin surged, I pressed the horn as hard as I could, and it never sounded. The driver saw me but only after she missed me by an inch. Ohio spiderwort can be found in to dry to mesic prairies and savannas. It grows along trail sides, fencerows, and railroads. It prefers wet, humid conditions. I went to the emergency room that evening when the pain became unbearable. The doctor told me I had completely severed my right thumb tendon and recommended me to a hand surgeon. A nurse wrapped my hand, wrist, and arm in a splint and I went home. The hand surgeon saw me a few days after and told me I had not completely severed the tendon. A thumb tendon was torn and new blue splint was fitted my hand, wrist and upper arm. I was sent on my way to function as best as I could with an immobile right hand. As long as I wore the splint, I felt no pain. It would take months for the tendon to repair (tendons take longer than broken bones to heal) but in the meanwhile, I learned to function with my non-dominate left hand and my husband, Jeff, helped me with everything that involved two hands. He opened containers and chopped up food for cooking. Not having my right hand was frustrating and maddening but not impossible. It would all be over in a few months. The plant’s range covers Massachusetts to Nebraska, up north to Minnesota and down south to Texas and Florida. It is resistant to herbicides and attracts butterflies and bumblebees. This is not what happened. My hand came out of the splint and within a few weeks, the ache was unbearable. I went back to the doctor and she discovered I had developed ECU tendonitis. Since my thumb was so weak, the outside of my hand (pinky finger to wrist) had compensated for thumb and now there were tears in the tendon running along the outside of my wrist. It would take a few months for a year to heal. That was the tipping point. After that, I developed lateral epicondylitis (tendonitis on the outside of the elbow. Also known as tennis elbow) in my right elbow. And then medial epicondylitis (tendinitis on the inside of the elbow, known as golfer’s elbow) in that same elbow. That occurred because I had been guarding my right hand by holding it against my body. Then my left elbow developed the same injuries as the right elbow. That happened was because my left arm had become overloaded from doing everything without the right hand for so long. Then the right outside of my foot became painful and I had tendinitis there too. That happened because I had been injured for over a year. My body had been thrown off for so long that it was mirroring itself. The stamen of spiderwort changes from blue to pink when radiation is present. I was barely able to function over the fall and winter months and there wasn’t a medication that put a dent in the constant pain I was in. The splint no longer helped. I tried physical therapy, massage, acupuncture, supplements, anything that might do something. While I tried everything within my means to heal, the physical therapy for my foot tendinitis took a terrible turn. I developed a severe allergic reaction to spray adhesive for tape (tape is often used to relieve pain in feet and leg injuries) and my leg broke out in a weeping rash and swelled to three times its size during Christmas. I ended up in the hospital after a blood test came back with the probability I might have a blood clot. I did not have a clot. Instead, I sat on the sofa with my leg firmly wrapped in ace bandages and kept my right leg elevated for two weeks till all the swelling was gone. Needless to say, Christmas was the lowest point of this whole debacle and things crept along for the better after that. The plant is edible, especially when young and tender. The greens can be eaten raw, parboiled or fried. The flowers can be eaten or candied. This spring, the pain greatly diminished. My hand therapist believed my laptop keyboard could the culprit, inflaming my wrist injuries. I hunted down an ergonomically correct one that helps people with my type of tendinitis. I’m typing now because of this keyboard. It has been a savior. My massage therapist was another savior. She listened to what my body was saying about the pain and her work and conversations helped me keep my sanity. And then there’s the care of my acupuncturist. He was deeply troubled over my condition and he too listened to what my body was saying. His help gave me pain free moments during very dark times. Dear friends and family members provided much consolation and compassion. I thank all of you. And last but not least is my wonderful husband Jeff. His continual willingness to help was a bright spots during this ordeal. His cheerful smile and wicked sense of humor helped me find reasons to get up in the morning. He is one of the greatest people I know and I am so lucky to have found him. 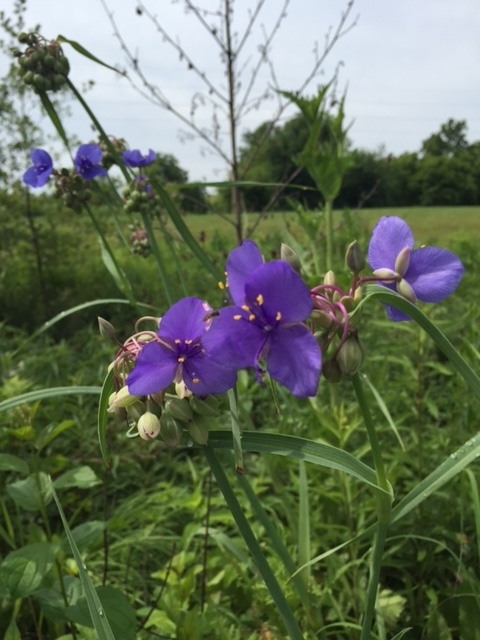 In the past, the Cherokee Nations have used a compound infusion of spiderwort for female ailments or kidney trouble. The roots were made into a poultice to treat cancer. The plant was also mashed and ground to treat insect bites. And so I have good weeks that are free from pain. But I have bad ones too where the pain won’t let go. My healers and friends rejoice with me during the good weeks and help me through the bad ones. I am incredibly privileged to know these people and receive their aid. I was forced to give up a lot this last year and a half. A lot. But to my shock, life continued and all survived. Pain became a doorway for me. It forced me to make choices about how I saw the world around me and how I would chose to participate with it. It’s a bitter thing to lose a year and half of your life. But, if I turn the lens of perception just so, I see I did not lose part of my life. I changed with my life. I made important internal decisions whenever I could. The time became holy; so much nonsense was removed because I couldn’t physically move or do anything about it. I was alone with my pain. And now I’ve come back to talk about that and other issues. My pain is greatly lessened and I can do more but the pain is not all gone and I am still learning the delicate balancing act of pain. 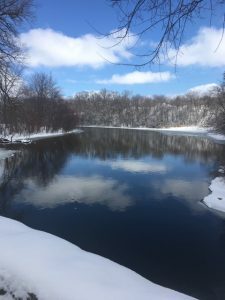 This blog entry is my re-entry into the conversation I left off when my injuries overcame me. Sparrow Post will continue to be a place where I muse on art, spirituality, and nature. The 3-petalled blossoms of spiderwort point to balance. Three is about opening the mind, letting go of binary thinking. The blue flowers are cheerful and exquisite yet only last for a day once they bloom. They last than less than a day in fact—once noon hits, the blooming flowers close and die. Pollination must happen in the morning hours and so bumblebee tumbles from flower to flower in the early light. A few other types of bees and flies join in the pollination. For this summer, I’m inserting native plants into each entry. Plants are our allies and they are at their zenith in these sunshine laden months. Native plants are hidden stories begging to be told, medicines waiting to be used. Beautiful Dana of Wild & Magic gave plant medicine to me during some of my worst moments and now I’m ready to learn on my own and share what I can in return. I will not pick these native plants with my hands but use my camera instead. Since my hand is not fully healed, I will not be concocting teas or salves but I will be reading and sharing. 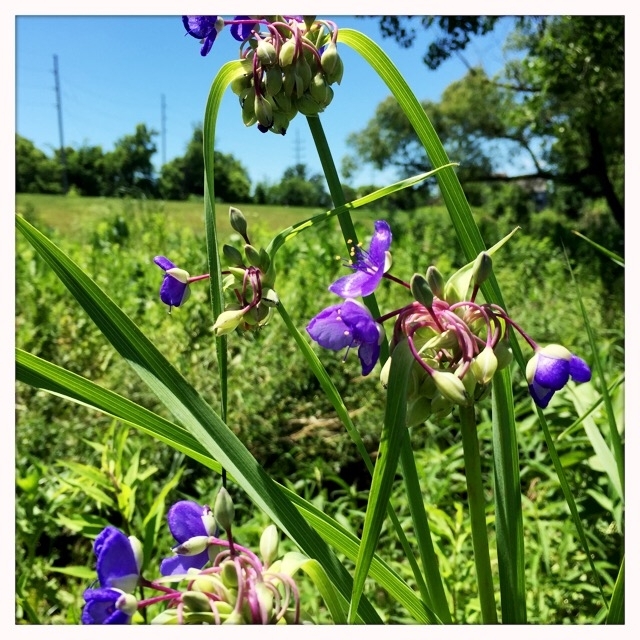 The color of spiderwort’s flowers, ranging from blue to purple to white, is a small part of its charm. Its true powers are hidden in its physical properties. The pleasant blooms rapidly pass away but the plant gives more than its beauty: it feeds the hungry and aids the suffering. Summer is here. Let us enjoy it. Thanks so much for writing this. It’s beautifully written. I’m so sorry that you’re going through this. I have severe tendon problems in a few places in my body and it has radically affected my life. I wasn’t sure, though, at the end, whether you meant that you are no longer in pain, or if you continue to be affected by your pain, but had eventually decided to view your life in a different way. Well, welcome back! What a beautifully written and illustrated post with which to mark your return! Oh dear, I’m so sorry you’ve gone through this veritable avalanche of physical ailments… I couldn’t help but cringe as I read of the horrible pain you suffered and still experience even now. I sincerely hope that your recovery will continue apace! Thank you, Danielle. What I’ve seen from this and from others’ stories about chronic pain is that when something physical goes wrong, it can set off an avalanche of body issues. Our bodies are balanced so carefully. finely tuned.